If you are already one of our clients, you will know this tool as the “personalized webpage”. We have added some features, given it a fresh look and re-named it to better express what the real value of this tool is: Quickly share your VR content with people on a personal basis. 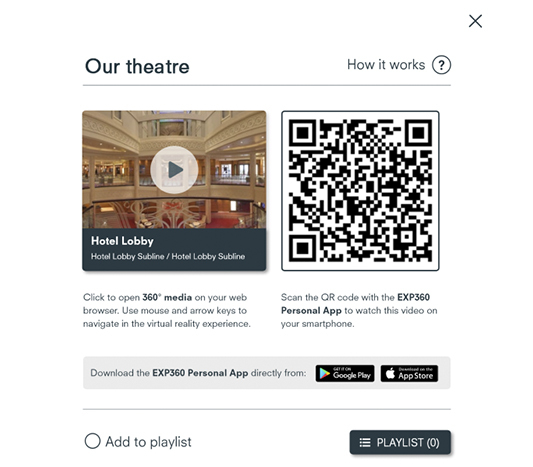 Our VR Quick Share enables you to send a webpage with 360 content to a client, an employee, a partner, a prospect, an applicant. It will take you a maximum effort of one to two minutes to prepare a dedicated page with personalized text and 360 content of your choice. The page also includes your logo. You can change or disable the webpage any time you like as the link you sent does not change though you never lose control of that page. Wonder what this could be useful for? Grab some innovative ideas from our use case inspiration page. You will be surprised about the many ways that our clients already use this tool.